Come enjoy a stay in our cozy Oceanside Beach Cottage, with community access (only 200 yards away) to the serene beach of Hatteras Village. Enjoy a fishing trip on one of the many charters out of Hatteras Marina, just down the road, or even some surf fishing on the beach. If fishing isn't your thing, come relax on the beautiful beach and watch the waves come and go. If you want outdoor activities try kite surfing, wind surfing or surfing in the OBX. There are also kayak tours and dolphin watching tours available nearby. Relax and enjoy the sand between your toes at e=msea2. 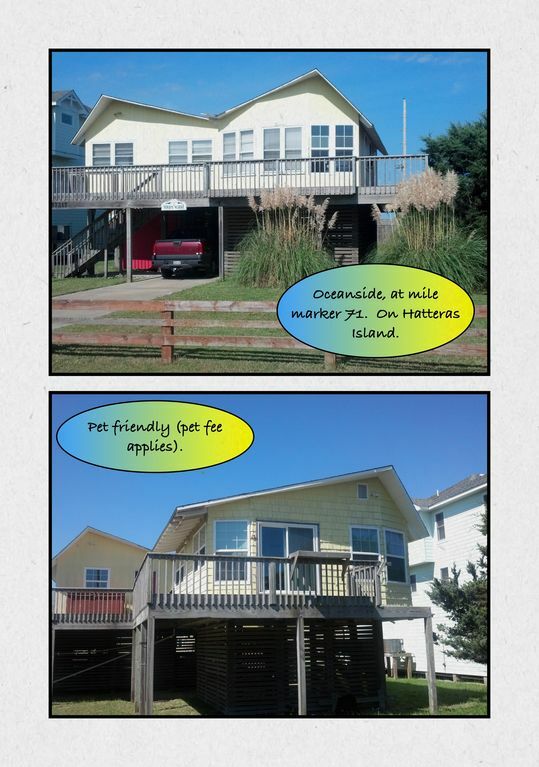 Recently remodeled, this elevated beach house is about a mile from the Ocracoke Ferry in Hatteras Village. And is conveniently located near many restaurants and local shopping. This cottage is offering up its studio apartment, for your enjoyment. The studio apartment has one queen bed and a sleeper sofa, newly renovated kitchen and updated designer bathroom. This unit sleeps 2 (or up to 4 using the sleeper sofa) and has a fully stocked kitchen, TV, DVD player, stereo, and access to a washer and dryer (on the property) as well as access to the large deck, with a hot tub and grill. We are also including wireless internet access and cable TV. Enjoy views of the Pamlico Sound from this cozy studio with your family or friends. If you need more space, ask us about renting the main cottage. The main cottage has one queen bed and one king bed, newly renovated kitchen and updated designer bathrooms. This unit can sleep 4 or 5 and has a fully stocked kitchen, TV, DVD player, stereo, and access to the large deck. Just like everyone that lives in the hurry and got to get things done world, we need a place that is quiet and relaxing. So, my wife and I decided to give the OBX a go. We fell for the sand, surf, wind, ... you can say 'everything about the OBX'. It took us years of saving, work, and dreams. but we finally did it, we now have a piece of the obx. And we want to share the joy. This cottage is really two homes, so the studio apartment is very peaceful and private. Fully tiled bathroom. There is a clothes iron and ironing board available for your use. Decent space, close to beautiful beach. Hot tub does not work. Location was great, short walk to beach. House was clean enough. Had small water damage but no surprise considering recent storms. Plenty of space for 2 people. However, hot tub would not heat and therefore unusable. We chose this house over others in the area because it had a hot tub. Owner would not respond to calls or email about hot tub problem nor was there a property manager to call. Owner has also not responded to my request for a small refund to compensate for no hot tub. Nice property,could use some maintenance,but other wise nice. Studio was very clean,no bad smells. Bathroom was very nice and clean. Enjoyed my stay here and will return if available. Had no problems and everything worked as it should. We were very happy with the property. Great place to stay for two and a small dog. Very clean. Great communication with Mr. Ho and his partner; great people to rent from. My only recommendation, because we are cooks, is to bring your own fry pan(s); great kitchen, great place to stay. We will go back! Cute, convenient to the ocean, but lacks in cleanliness. While the property is cute and quaint, enough for only two and is close to the beach, we found it was in need of a ceiling to floor cleaning. The exterior of the main unit is in need of a paint job, and the exterior clutter needs organized. The hot tub was housing tree frogs, and the grill housing wasps. The outdoor shower did not work. Mr. Ho, however was very accommodating and accessible and offered to reimburse me for the cleaning of the bathroom that I performed on arrival. Dogs are allowed, so if you have allergies, I'd not reccomend. My wife and I spent the week of Columbus Day at e=msea2. It is very close to the ocean with a view of sound. Some businesses were closed or on reduced hours for the season, but we still had plenty of options for things to do and places to eat. We were fortunate to have excellent weather for the second week of October. Spent one day on Ocracoke; visited "Shelly Island" another; took several long walks along the beach. Beach near the house was not at all crowded. We did have some company (mostly surf fishers) at Shelly Island and Cape Hatteras. The appliances are new or nearly new. The recently remodeled bathroom is very nicely done. Satellite TV & WIFI worked great. The unit we stayed in had the feel of a nice hotel efficiency and though there are neighbor houses close by it still felt quite private. Looking at when we can schedule another visit! My husband and I were celebrating our 10th wedding anniversary with 2 weeks at the beach. We needed a place that accepted dogs, and this place fit our needs perfectly- close to the beach, back yard to play fetch, and we'll-stocked kitchen so we could cook. The hot tub was an added bonus! This is a Sunday to Sunday rental. Pet fees are $75.00 (plus tax, not included) per pet. Deposit will be mailed back to you within 21 days after you check out. It would be in a form of a bank (cashiers) check, or company check. If you choose to, you could send a self addressed and stamped envelope to expedite the process (and ensure your address is correct).